This tutorial provides you with a foundation for working with Adobe Photoshop brushes. It is the first lesson in the Adobe Photoshop CS6 Digital Classroom book. For more Adobe Photoshop training options, visit AGI’s Photoshop Classes. The Erodible and Airbrush tips were added to Photoshop CS6. The Erodible tip allows you to scribble, draw, and wear out your brush tip much like a pencil or piece of chalk. The Airbrush tip offers extra controls and settings that allow the brush to act more like a real airbrush. In this example, you will use one of the new Airbrush tips to make snow blow off the skier. Airbrushing is a painting technique that uses a stream of air to apply the paint to a surface. 1 Select Background in the Layers panel, press and hold the Alt (Windows) or Option (Mac OS) key, and click the Create a new layer button at the bottom of the Layers panel. This opens the New Layer dialog box so that you can immediately name the layer. 2 Type Strokes in the Name text field, and then click OK.
3 Select the Brush tool ( ), and then select Window > Brush; the Brush panel appears. 4 Scroll down in the Brushes panel to select the Airbrush tip labeled 80. Once the brush is selected, you see that options specific to the selected brush tip appear at the bottom of the Brushes panel. You can experiment with the settings and see a preview of your brush stroke. Spacing: Use it to adjust the space between brush applications. Spacing set at 100% will give you even spaces between applications. 5 Change settings and paint the image area. You can use any color. Experiment with different settings to see how the changes affect the brush stroke in the image area. 6 Once you are finished experimenting, choose Select > All, and then press the Delete key. You can repeat this step any time you want to paint again. 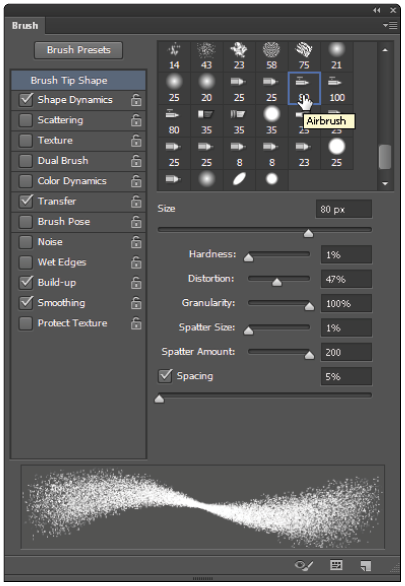 7 Reset your 80 Airbrush to the default settings by clicking the brush again in the Brush panel. Click the Enable airbrush-style build-up effects. If you hold the mouse button on one place, this feature spreads the paint much like an actual airbrush. Set flow and build-up options in the Options bar. 10 If your Foreground color is not white, press the letter D to return to the Default colors of a Black Foreground and a White Background. 12 Confirm that you still have the blank Strokes layer in the Layers panel selected, and start painting snow flying behind the skier. If you want to start over again, choose Select > All and press Delete. 1 To save the Brush, click the New icon ( ) located in the bottom-right of the Brush panel. The Brush Name dialog box appears. 2 Type MyBrush in the Name text field, and then click OK.
3 If you want to use your brush in the future, you can find it by selecting Window > Brush Presets and scrolling to the bottom of the list. Your saved brush appears there. 4 Choose File > Save to save this file. Keep it open for the next part of this lesson. If a Photoshop options dialog box appears, click OK.